TORONTO — Kawhi Leonard says he's healthy and excited to be a Toronto Raptor. Leonard finally addressed the media in a jam-packed press conference, the first time he's spoken publicly since the blockbuster trade that sent DeMar DeRozan to San Antonio. Despite reports that Leonard plans to test free agency next off-season, the former defensive player of the year says he's excited to play in a "basketball city," where fans embrace the team. "As long as I have on a jersey I want to play basketball," said the soft-spoken Leonard. "I came here with an open mind. I want to do great things so I'm going to make sure I put in a full effort on the court each and every night. "By winning games this is how you get star-calibre players to want to come here and play." Raptors president Masai Ujiri swung the blockbuster deal on July 18, sending DeRozan, Jakob Poeltl and a draft pick to San Antonio for Leonard and Danny Green. 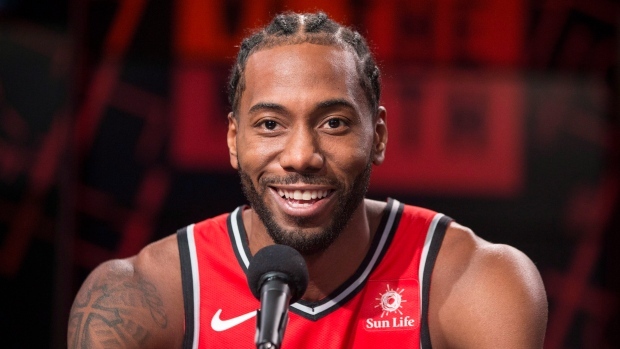 Leonard had not spoken with media until Monday morning but Ujiri had said all summer that he's not concerned about the 27-year-old's commitment to Canada's lone NBA franchise, saying Leonard worked out with Toronto's coaches in Los Angeles, and has visited the city a couple of times. After several questions to Leonard and Green on Monday about their desire to stay in Toronto, Ujiri chastised the media for casting a negative light on Leonard's arrival. "The narrative of not wanting to come to this city is gone," said Ujiri, who interjected into a question directed at Green and Leonard. "I think that's old and we should move past that. "Believe in this city, believe in yourselves." The Raptors open training camp Tuesday in Vancouver.